Friends Journal’s QuakerSpeak video series began five years ago. In that time, over two million people have tuned in to watch our short videos about Quaker practice, theology, activism, history, and ministry. How has QuakerSpeak changed how the world sees us and how we see ourselves? How do Friends use it in meetings and First-day schools? We will stop collecting new submissions for the September 2019 issue on 6/10/2019. 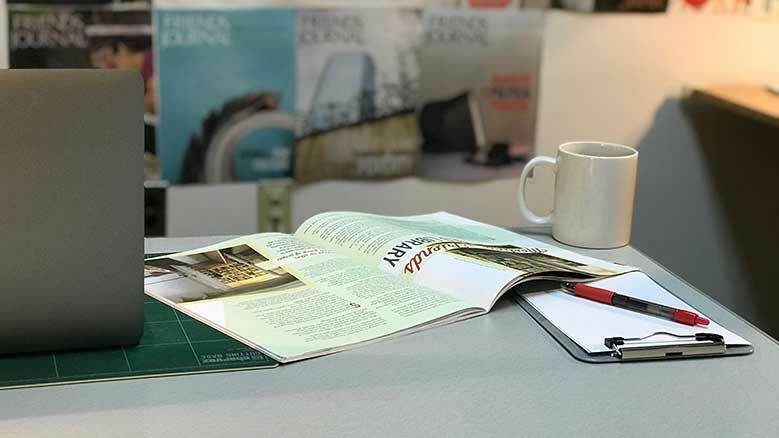 Since 2012, most of the monthly issues of Friends Journal have been set aside for specific themes. Every eighteen months or so we poll readers and dream up ideas for future issues. Sometimes we’ll be inspired by a particular article that struck a chord with readers; other times we’ll look at a topic that Friends aren’t talking about enough. There are some relatively perennial themes (race, art, finance, social witness, outreach), but even with these, we try to find hooks that might bring fresh voices to the conversation. We also keep two issues a year open: no theme and no expectations. Most of our unsolicited articles go into a “General Submissions” list that we hold for these issues. Sometimes a choice is easy: we’ll get a blockbuster article that we know we just have to print. But just as often we’ll run some quiet piece of Quaker life that is offered us without regard to our schedules. Please be aware that since we only run two un-themed issues a year, response times can be longer on these, from 3-9 months. Also, please note: All poetry should be submitted separately here. Half of the world’s Friends live in Africa; Kenya alone has almost twice as many Friends as the United States. But the African yearly meetings’ beginnings as missions from evangelical Friends created theological and cultural gaps with American unprogrammed Friends from the start. How do we begin to bridge differences and learn from one another? Due July 8, 2019. One of the most important historic Quaker testimonies stood against gambling, yet it’s a topic we rarely seem to talk about anymore. Do we participate in raffles or games of chance? Does it matter? How about investments in the stock market? Does gambling foster materialism? Is it an addiction we need to work against? Due August 12, 2019. What makes a Quaker kid Quaker? Let’s try having a Friends Journal issue by and for younger Friends! Due September 9, 2019. The opioid crisis in America is killing friends and family members across the country, but it’s something Quakers don’t talk about much. How do we help members in their addictions and how do we stand as a society against those who profit against addictions? Many Friends were active in the temperance movement against alcohol. Where do and should we stand today on this and issues like legalized marijuana? What about the growing legal trade in pharmaceuticals, which have helped extend lives while also contributing to addictions in some cases? Due October 14, 2019. One of the things that define many of us as Friends is our reliance on Quaker process for decision making. What is it? How does it different from consensus? How do we respectfully adapt it for non-spiritual uses? Where did it come from and is it really still the best way of making every kind of decision? Due July 13, 2020.